Join Us for Watch Madness! It’s March and we’re mad about Rolex watches, so join us for Bob’s Watches first-ever Watch Madness event! 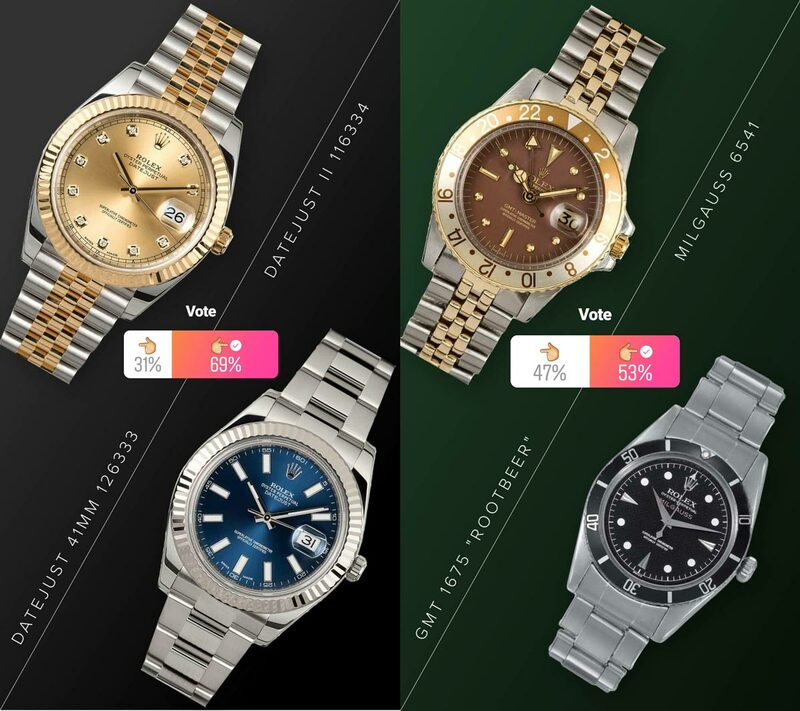 We’re pitting 16 modern Rolex watches against 16 vintage Rolex watches and it’s up to you to vote on Instagram to decide which watches will move forward to the next round. 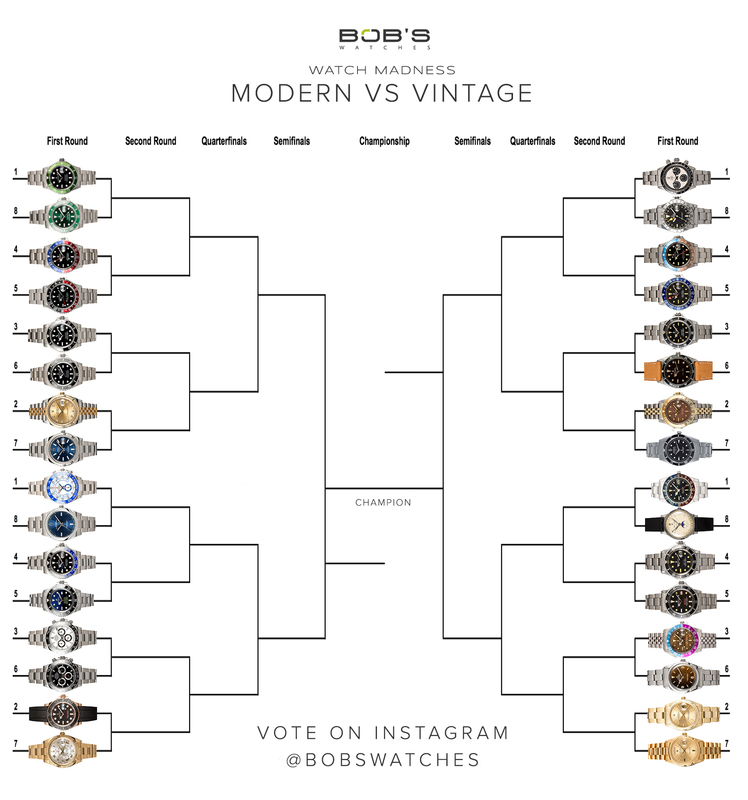 With 32 watches on the bracket, be sure to submit your vote on our Instagram Story @bobswatches. A printable version of this bracket is provided at the bottom of the page. The Paul Newman won. Details at the bottom. Our first polling will happen on Tuesday, March 13th. 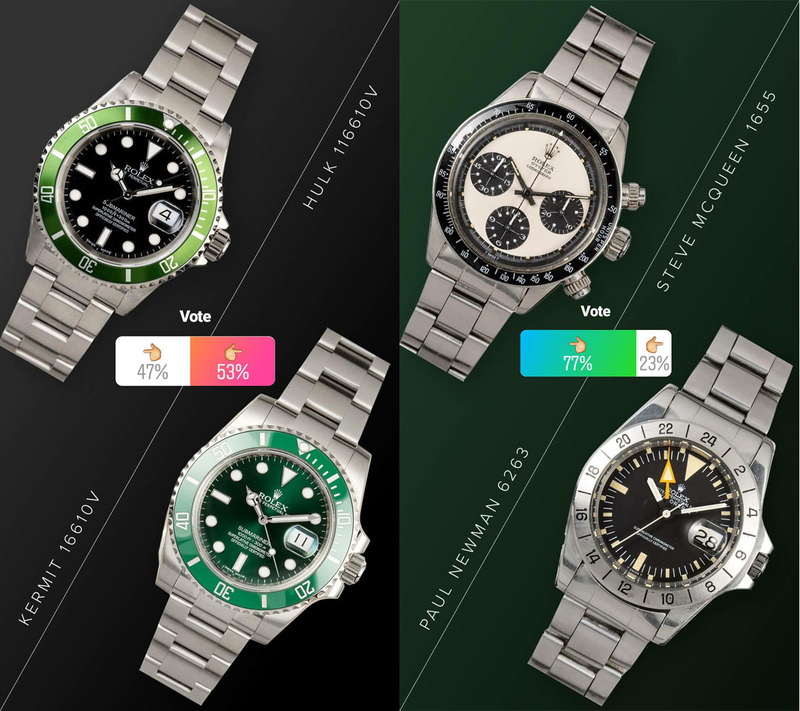 Which Rolex watches do you think will make it to the Sweet Sixteen, Elite Eight, and Final Four? And which reference will come out on top to win the Watch Madness tournament? It’s up to you to decide! 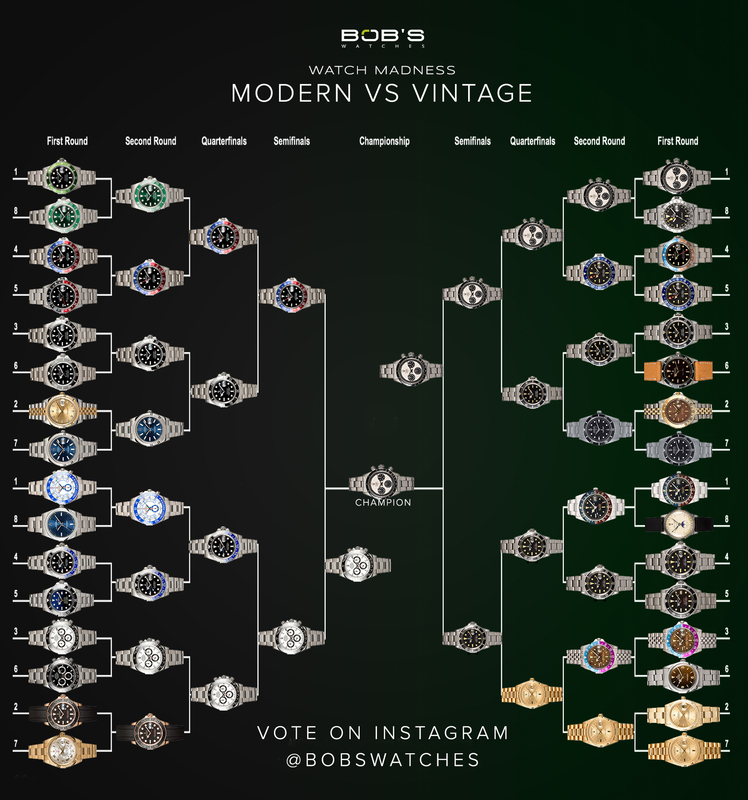 Follow us on Instagram at @bobswatches to cast your votes in our story. Also, don’t forget to reference this blog page for updated results on the watch competition. Which Rolex will be crowned the King of the Crown? Will it be the vintage Daytona ref. 6263 Paul Newman? Or perhaps the GMT-Master ref. 1675 Pepsi? Or maybe the new Daytona ref. 116500 Panda? 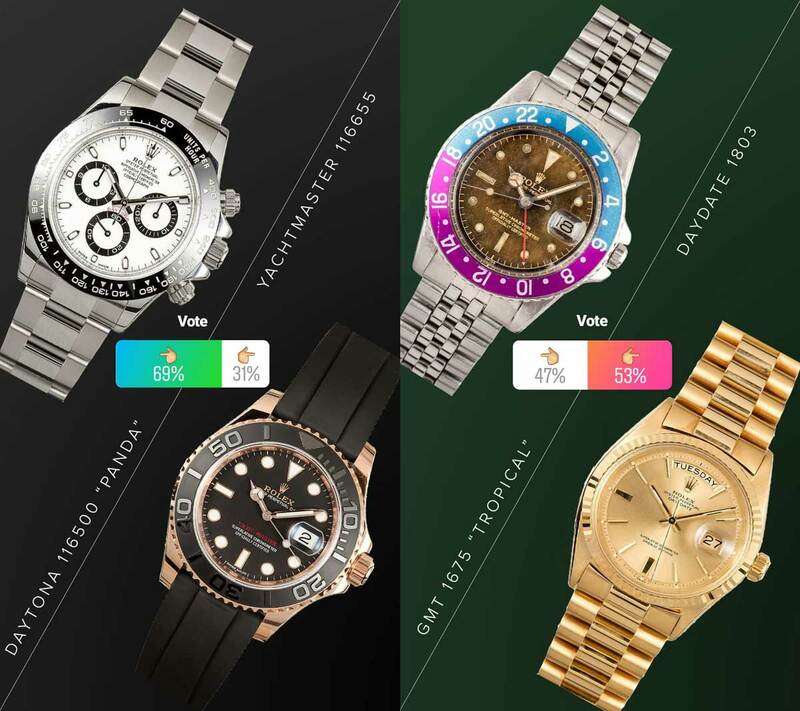 Pick your favorites, join in on the voting, and we’ll announce the winning watch at the end of the month. May the best Rolex win. Get the printable version of the bracket here. On Tuesday, March 13, 2018, there were two matches. Here are the results of the modern and vintage bracket. Kermit 16610V Versus the Hulk 116610V: With a total of 2421 votes the Hulk 116610V won with 53% of the votes (1285). Paul Newman 6263 versus the Steve McQueen: The Paul Newman won by a landslide with 77% of the votes out of 2402. The Kermit vs the Hulk and the Paul Newman vs the Steve McQueen. On Wednesday, March 14, we had another matchup on the modern and vintage bracket. 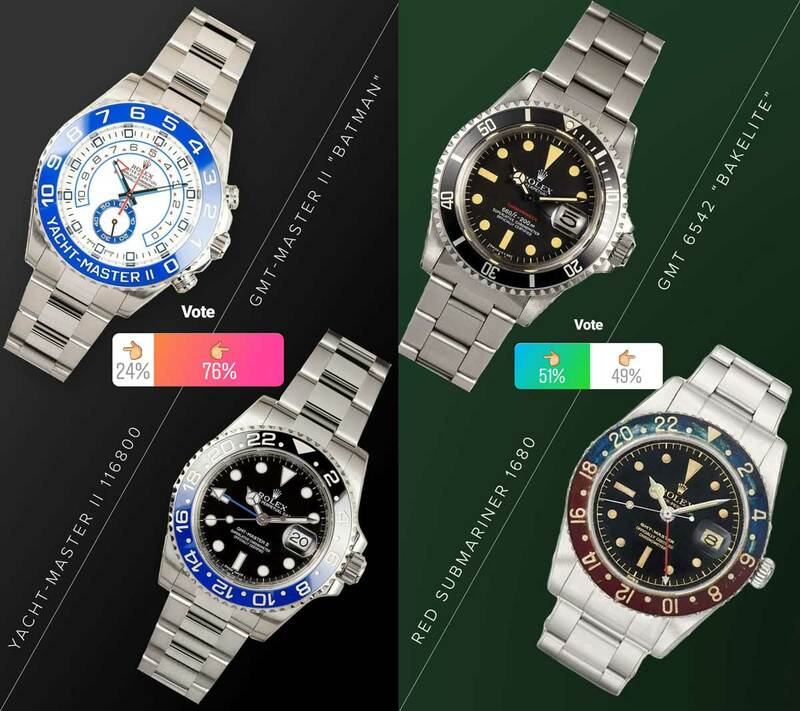 GMT-Master Pepsi 16750 vs GMT-Master Coke 16710: The Pepsi is the winner with 64% of the votes out of 2506 votes! Pepsi 1675 vs Blueberry 1675: Out of 2495 votes the Blueberry 1675 won with 54%. On Thursday, March 15th, we saw a clear pattern with these models. People love the classic Submariner. 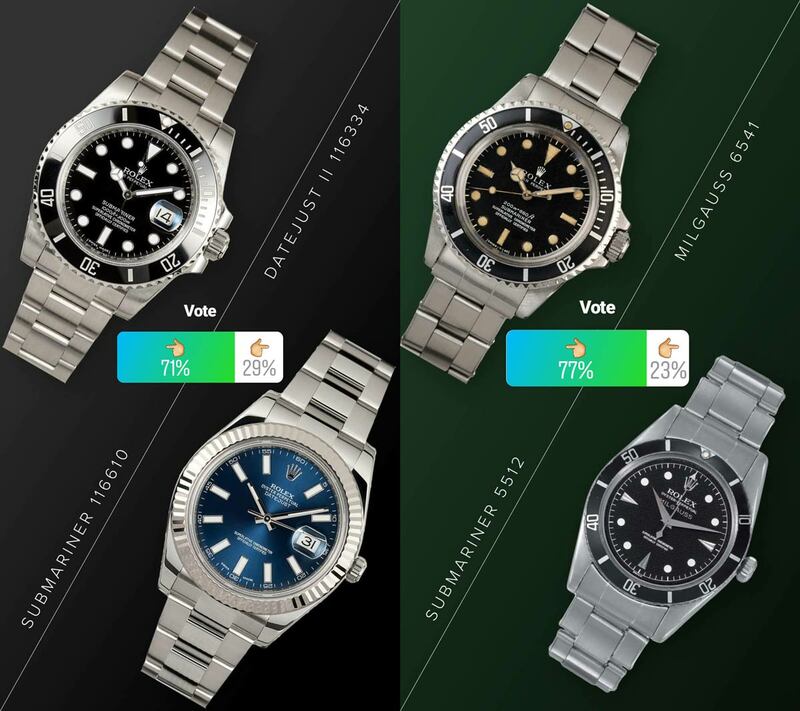 Submariner 116610 vs Sea-Dweller 116660: With 1,564 votes for the Submariner and only 640 for the Sea-Dweller, the Submariner won with a 71% of the votes. Submariner 5512 vs Turn-O-Graph 6202: From the vintages, we saw overwhelming success from the Vintage Rolex Submariner 5512. Out of 2177 votes, the Submariner 5512 took 1,580. Watch Madness is going strong. The Submariner 116610 and the Submariner 5512 take the victory. Friday, March 16th we look at the battle of the Datejusts and two vintage watches that people love. Datejust 41MM 126333 vs Datejust II 116334: It was quite the decisive battle here with the Datejust II getting 1334 votes out of 1940. 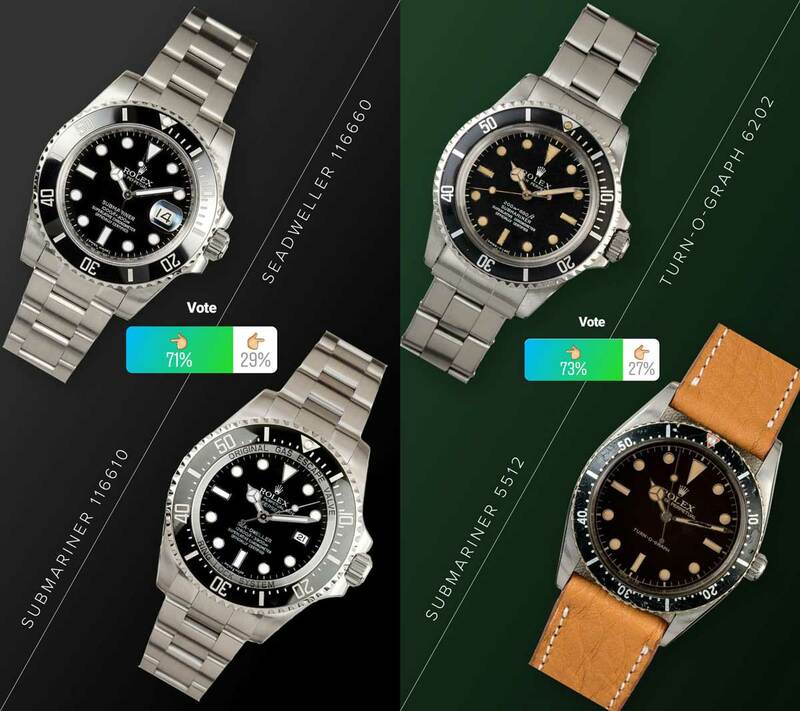 GMT-Master “Root Beer” vs Milgauss 6541: The Root Beer lost with 930 votes while the Milgauss received 1040 votes. On Monday, March 19, 2018, we had another great matchup. 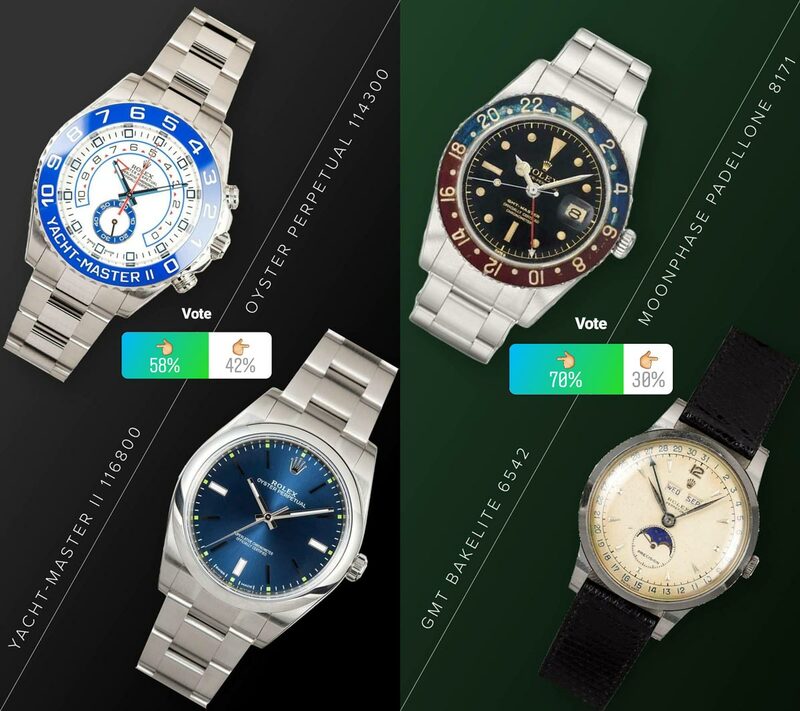 Yacht-Master II 1166800 vs the Oyster Perpetual 114300: Out of 2218 votes the Yacht-Master won with 1277 votes. The GMT-Master Bakelite vs the Moonphase Padellone 8171: The Bakelite won with getting 70% of the votes (1646 out of 2339). The winners on Monday were the Yacht-Master II (58%) and the GMT Bakelite 6542 (70%). Tuesday, March 20, 2018, was a great matchup. One bracket won by a landslide and the other was nail-bitingly close. James Cameron vs the Batman: The James Cameron took the loss. It only received 820 votes out of 2466 (33%) while the Batman won with a staggering 1646 votes. The Red Submariner vs the Double Red Sea-Dweller: This was our closest matchup yet. Out of 1740 votes, the Red Sub took the win with 950 votes to 913. Our closest yet. Wednesday, March 21, 2018, was a battle of a pair of Daytonas and tropical watches. 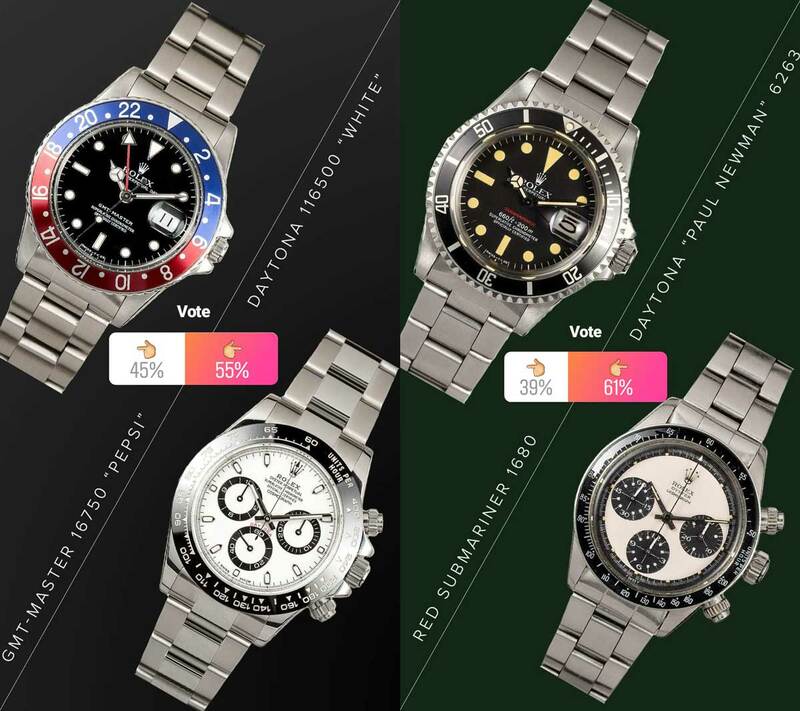 GMT-Master 1675 “Tropical” vs Explorer 1016 “Tropical”: The GMT won with 64% of the votes. The White Dial Daytona 116500 won by just a hair. The GMT won by 64% over the Explorer. Thursday, March 22, 2018, we got to see the dress watches and two of the newest models face off. 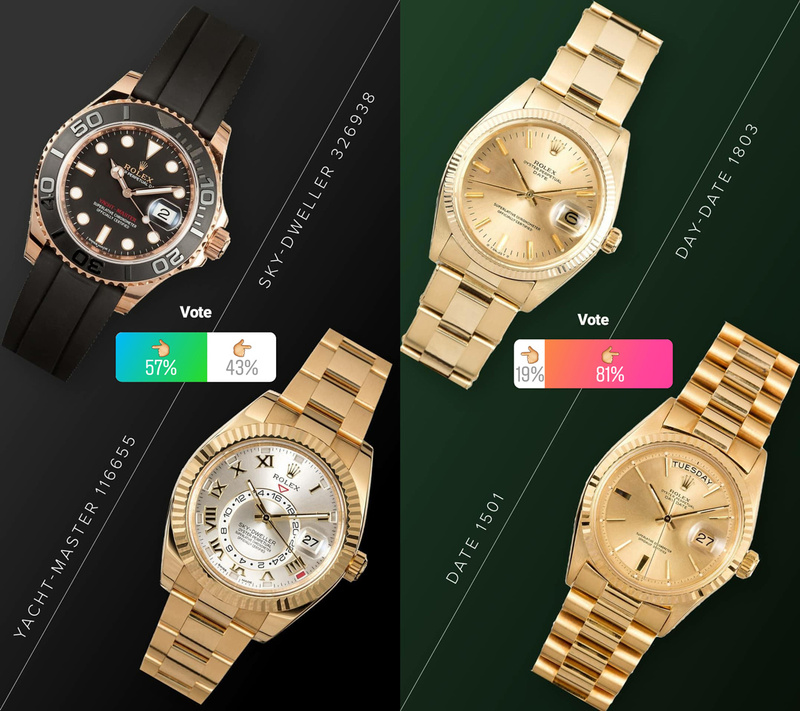 The Everose Gold Yacht-Master 116655 vs the Sky-Dweller 326938: The Yacht-Master in Everose Gold was the winner with 57% of the votes out of 2223 votes. The Date 1501 vs the Day-Date 1803: The Day-Date was the clear winner garnering more than 80% of the votes. The Yacht-Master won at 57% and the Day-Date at 81%. With only a single fight this Friday on March 23, 2018, there was a clear winner. 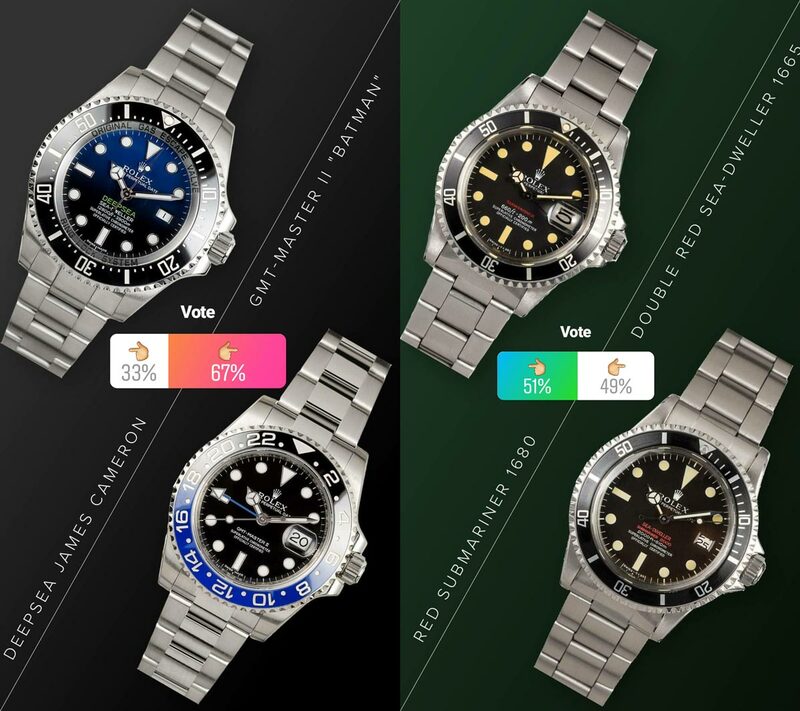 The Submariner “Hulk” 116610LV vs GMT-Master 16750 “Pepsi”: The Pepsi won with 60% of the votes. The Paul Newman Daytona vs Vintage GMT-Master Blueberry: The Paul Newman took this one by a long shot with 69% of more than 2000 votes. The Pepsi and the Paul Newman were the winners of the poll. After our quick pause with Baselworld coverage, we return to Watch Madness. Submariner 116610 vs Datejust II 116334: The Submariner won with a 71% advantage over the Datejust II, garnering 2128 out of 2984 votes. Vintage Submariner 5512 vs Vintage Milgauss 6541: Though the Milgauss is work far more than the Submariner, the 5512 wins with an overwhelming 77%. 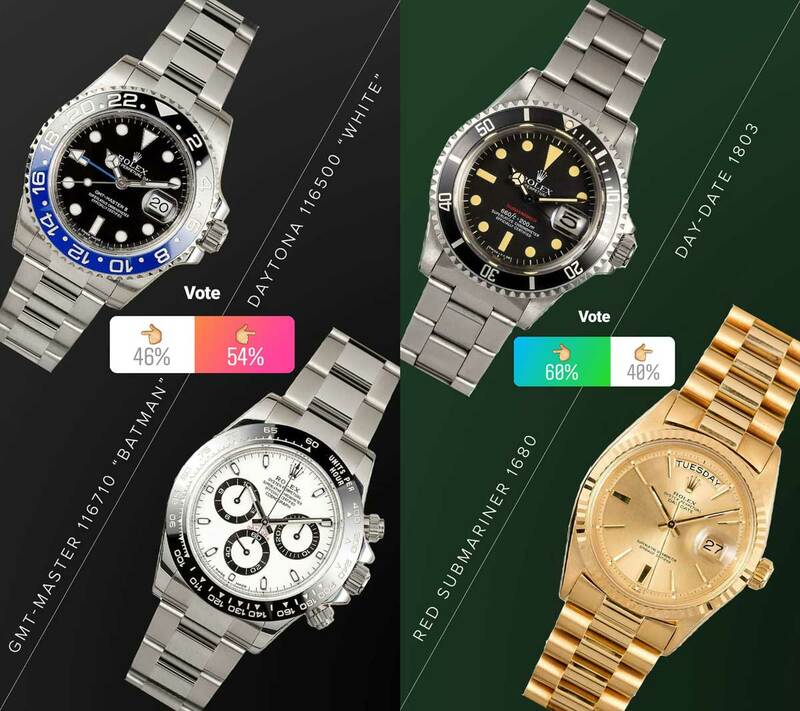 The Submariner won with 2276 votes, while the Milgauss only got 704 votes. The Submariner 116610 with 71% and the vintage Submariner 5512 won with 77%. We had a back to back matchup yesterday with two stunning matchups. 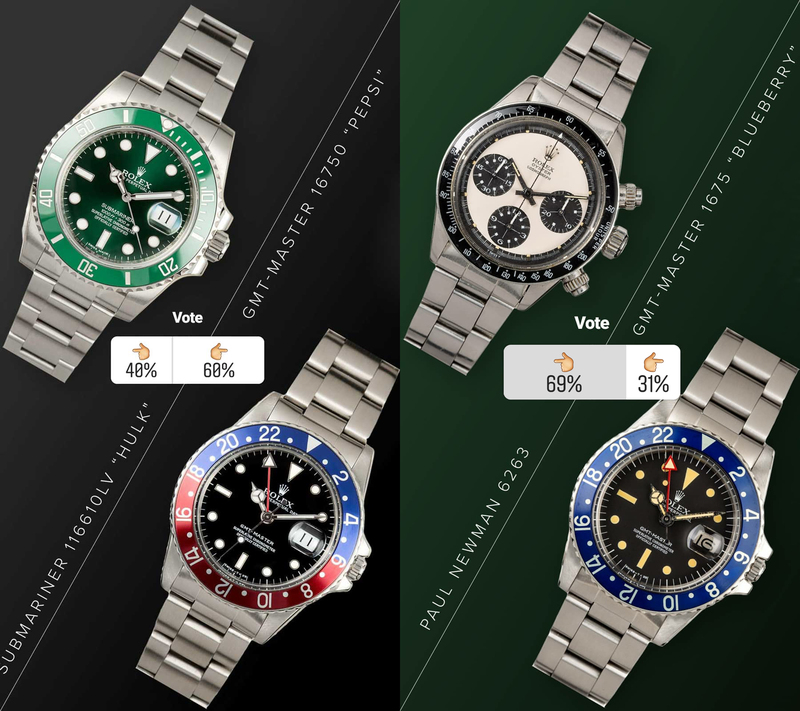 The Yacht-Master II 116800 vs the GMT-Master II “Batman”: The Batman is the winner of this match, getting 2497 vs the Yacht-Master only getting 773 votes. The Red Submariner 1680 vs GMT-Master “Bakelite”: While both of these watches are iconic, the Red Sub walks away with the W getting 1395 while the GMT received 1316 votes. The Batman won with 76% votes and the Red Submariner won by just a hair at 51%. The GMT-Master 1675 “Tropical” vs the Vintage Day-Date 1803: This one left us scratching our heads with the Day-Date 1803 winning with 1540 out of 2918 votes. The Ceramic Daytona was expected to win, and the Day-Date took us by surprise. The results are in with our Elite Eight! 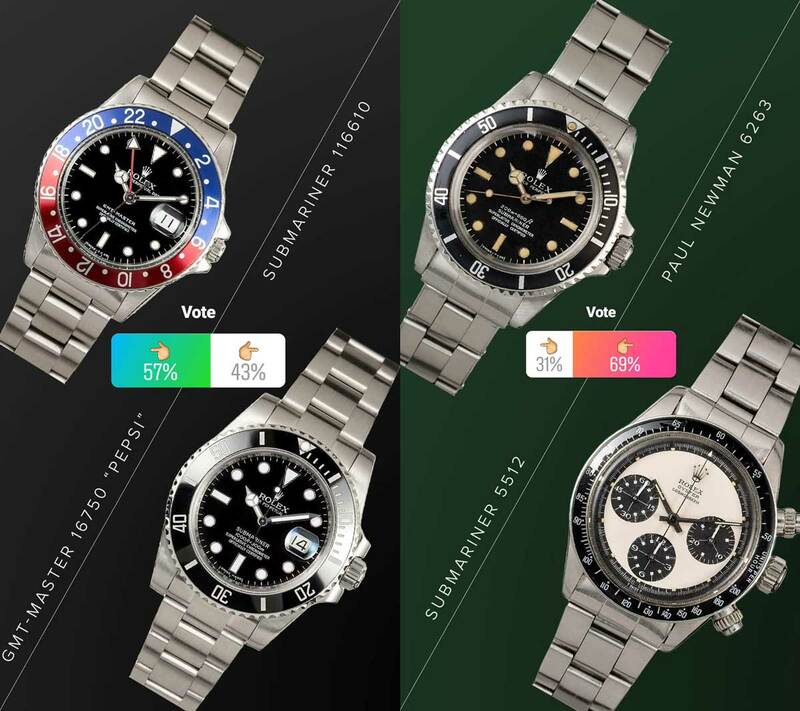 The GMT-Master 16750 “Pepsi” vs Submariner 116610: The GMT-Master takes a miraculous victory of the Submariner getting 1624 votes while the 116610 got 1218 votes. The Vintage Submariner 5512 vs Daytona “Paul Newman”: The Paul Newman easily took this round taking home 2003 votes while the vintage Sub only received 883. The Pepsi won the poll at 57% and the Paul Newman won with 69%. On the same day, we had another match up. The GMT-Master 116710 “Batman” vs Ceramic Daytona 116500: The Daytona 116500 “White” won the round getting 1623 votes while the Batman only got 1395. Vintage Red Submariner vs Day-Date: The winner here was a stainless steel Red Submariner 1680. The Sub had 1776 votes out of 2987. The Batman lost to the Daytona 116500, and the Red Submariner won with 60%. Last Friday, we paired up our final four! We are very excited to see the results of the championship game. 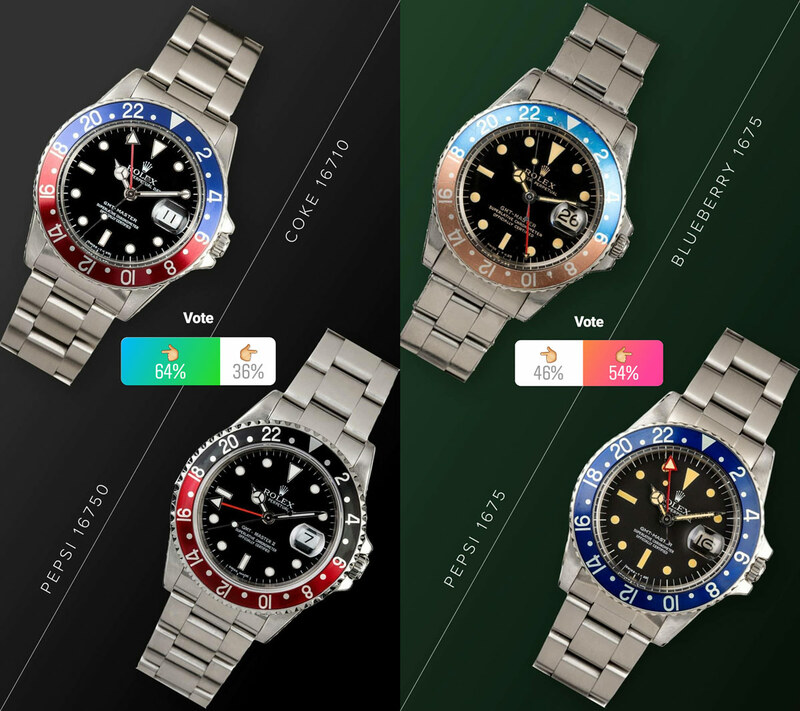 GMT-Master “Pepsi” 16750 vs Daytona 11650 “White”: The GMT-Master lost to the ceramic Daytona with a 1138 to 1404 vote. Red Submariner 1680 vs Paul Newman Daytona 6263: We see that the Paul Newman is staying strong at a 61% vote, getting 1555/2538. The Ceramic Daytona and the Paul Newman will be the finalists on Monday, April 9th, 2018. 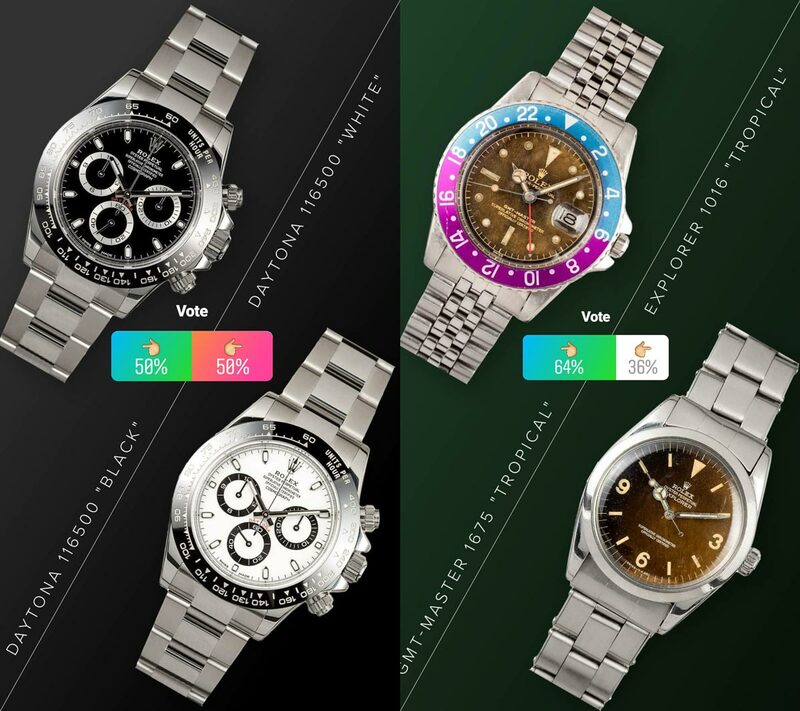 Ceramic Daytona 116500 vs Vintage Paul Newman: The championship game was very close. 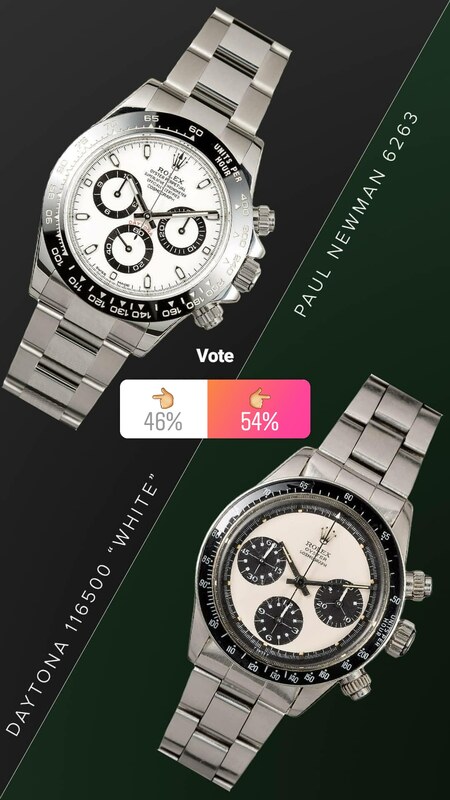 In the beginning, the Ceramic Daytona 116500 immediately took the lead, leaving the Paul Newman in the dust to a 60% to 40% ratio with over 100 votes. As time progressed the Paul Newman began to gain on the 116500. After a long 24 hours, the Paul Newman won at a close 54% garnering 1496 out of 2747. The winner is the Paul Newman 6263! The Paul Newman wins the whole bracket. Thank you to everyone who participated in our Watch Madness bracket! In total, we’ve received more than 77,000 votes.